Formed during World War II, the United States Office of Strategic Services (OSS), was organized for special operations and intelligence gathering and analysis. Included in its mission was the implementation of, and training of foreign forces in, propaganda, espionage, subversion, and sabotage. After the war, OSS functions were transferred to the newly formed Central Intelligence Agency (CIA). 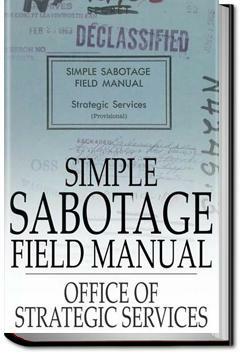 This “Simple Sabotage Field Manual” was used by OSS agents in training “citizen-saboteurs” in methods for inciting and executing simple sabotage to thwart industry and other vital functions in Axis-occupied areas. (1) Use materials which appear to be innocent. A knife or a nail file can be carried normally on your person; either is a multi-purpose instrument for creating damage. Matches, pebbles, hair, salt, nails, and dozens of other destructive agents can be carried or kept in your living quarters without exciting any suspicion whatever. If you are a worker in a particular trade or industry you can easily carry and keep such things as wrenches, hammers, emery paper, and the like.